Located in the north-east of Cambodia, the hilly province of Mondulkiri is nestled against the border with Vietnam northeast of Phnom Penh and is home to several hill tribes like the neighboring Ratanakiri province. Known for its beauty with thickly forested hills and powerful waterfalls, Mondulkiri offers wonderful opportunities for Eco-tourism in Cambodia. 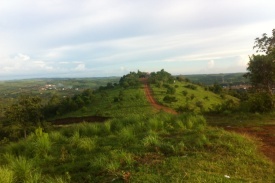 We leave Phnom Penh or Siem Reap early in the morning by road to Sen Monorom, the capital of Mondulkiri province. We drive to Snoul via Kampong Cham on Highway 14 (a dirt road) that connects to Sen Monorom. The path is generally flat, yet bumpy from time to time. 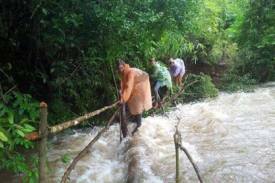 In the rainy season some slopes can be challenging for those who travel without a 4WD. We arrive at Sen Monorom for 7 to 9 hours after departure. We begin the day with a hearty breakfast at the lodge and then travel by car to Pu Lung Bunong village. There, one can enjoy safe tubing down the O Plai River. Soon after, we have lunch near Bou Sra, the largest waterfall in Cambodia. 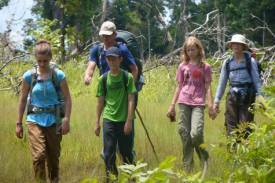 In the afternoon, we’ll enjoy a short hike along the hilltops between Phnom Doh Kromom and Lao Ka, the three oceans. In the evening, dinner is served near the bonfire at the Lodge. We begin the day with a hearty breakfast at the lodge and then embark for a full day elephant ride to O Ranna waterfall. 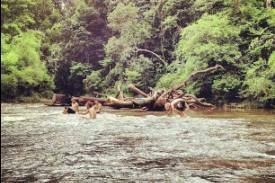 Once on site, we’ll swim in the fresh river ponds located near the waterfall and we’ll enjoy lunch there. In the afternoon, we’ll get back to the village of Pu Tang Bunong by elephant before heading back the nature lodge by car for a wonderful dinner around the bonfire. We begin the day with a hearty breakfast at the lodge. This morning we are free at leisure in the town centre. You’ll enjoy the bustling market offering various local arts and crafts. In the afternoon, we rest and enjoy a great herbal sauna at the lodge. In the evening, a nice BBQ dinner is offered with music and a tribal music performance is available on request. 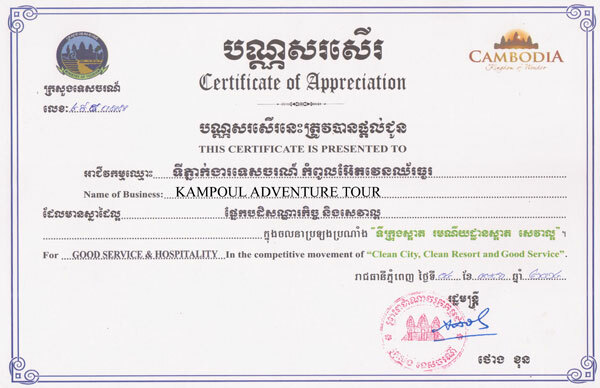 Return to Phnom Penh or Siem Reap by road. 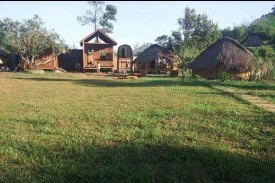 Depart Phnom Penh or Siem Reap by private A/C transportation to Mondulkiri, an isolated forested province. Transfer to hotel. Continue to Choub for visiting the rubber plantation and a rubber factory. In the afternoon, visit interesting Nokor Bachey temple in the area which dated back to 12-13th centuries ( from the Angkor era ), Phnom Pros (the hill of men), Phnom Srey (The hill of women). Dinner and overnight at the hotel. Drive on a very bumpy road to Bou Sra, one of a largest waterfall in Cambodia. Enjoy the beautiful scenery with the countryside surrounding Bou Sra Picnic lunch. Visit traditional tribe villages. Stop at a pepper and coffee plantation. Dinner at local restaurant. Explore the jungle by elephant. 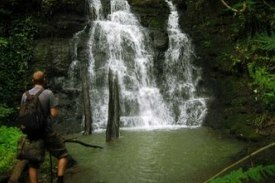 Visit the nearby hill tribes village and waterfalls. Picnic lunch. Dinner at local restaurant. Overnight at the hotel. After breakfast , return to Phnom Penh. Lunch en route. Transfer to hotel. tyre maker Michelin, on the way. Lunch at local restaurant in Snoul. 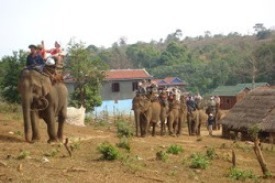 Travel 7 Km north of Sen Monorom to visit the village of Pu Lung, where elephant treks are organized. Full exploration of the forest by elephant. Lunch on site. 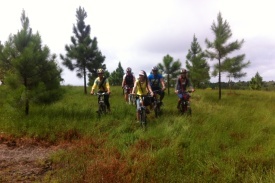 Departure for 37 Km on the bumpy road along two rivers to Bu Sra. Pass through several ethnic Phnorng village on the way to Bu Sra. 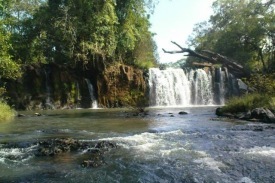 The road to Bu Sra leads past Bu Sra Water fall, one of the largest in Cambodia. Explore the countryside surrounding Bu Sra. Enjoy the beautiful scenery with its rice fields. Visit traditional Phnorng villages, a coffee and paper plantation. Lunch and dinner at Bou Sra Guesthouse. Overnight at Bou Sra Guesthouse. Full day drive from Bu Sra to Phnom Penh/Siem Reap via Sen Monorom (357 km around 7 hours). Lunch in a local restaurant on the way. Cross the Mekong River by ferry near Prey Veang and drive to Phnom Penh. 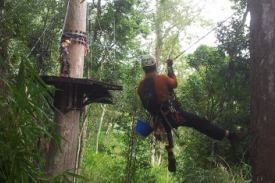 Explore for wild life animal sanctuary hard trip jungle motorbike and working. observe local environment during traveling 3-4 hour to Memang (gold mine) or Srechhok village stop for lunch , after lunch continue by motor with driver through forest, jungle about 3:30h . Day2: Picnic for breakfast and hid the motor after trekking to another mineral lick pond observe the jungle and checkout situation of animal hoe and camping for snip to see animal. Day3: Breakfast , trekking explore to jungle different way to motorbike stop for lunch about 12:00am after lunch continue by motor through jungle to O'katoh river doing a great fishing around 3-4 O'clock. Day4: Day5 day6 similar trip explore for wildlife, but all our trip we do are different patch and different way back by GPS data. Note: A number of animals are at the low great so sometime at day2 or day5 that you see animals because larch area cover with jungle, dose not forest high bamboo grass. some animal such as elephant , bunting, gibbon, large deer , wild boar. 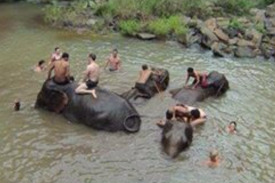 This 3 day trip to the Dei Ey Community Forest in the Mondulkiri Protected Forest takes you into a riverside forest camp and the world of the Phnong people where you will spend time learning about the lives and culture of these famous woodsmen and experience firsthand their elephants walking in nature. Learn about the birds, animals, plants and trees of the forest. Camp on the Chbar River on the boundary with the Phnom Prich Wildlife Sanctuary. The two protected areas — Phnom Prich Wildlife Sanctuary and Mondulkiri Protected Forest — form part of one of the largest complexes of connected protected areas in Southeast Asia, covering more than one million hectares in a region referred to as the Eastern Plains. The area is considered a World Biodiversity Hotspot. After Breakfast at hotel, you will be transferred to the Dei Ey Community Lodge. After a 60 minute ride to the Dei Ey Community Lodge meet your community hosts. Starting in the Dei Ey Spirit Forest, hike through the village meeting up with your elephantine walking companion. Saunter with the elephant in the forest getting to know these intelligent giants . In the forest learn about the life of the Phnong and their intimate relationship with their forest environs. Enjoy at picnic lunch under the forest canopy. Return to the village and community lodge for a relaxing evening and an evening chat with the village hosts. Early risers stalk forest birds and look for signs of wildlife before returning to the lodge for breakfast Starting the trek in the Dei Ey Spirit Forest, hike through the village before entering the Community Forest. 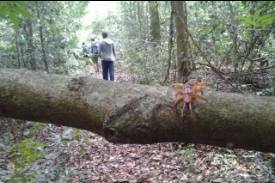 Along the way down to the Chbar Forest Camp learn to look for signs of wildlife in this elephant corridor. Enjoy at picnic lunch under the forest canopy. Reaching the Chbar River, set up camp, enjoy a campfire dinner before retiring to the lull of the nocturnal symphony of the tropical forest. Early risers stalk forest birds and look for signs of wildlife before returning to the campfire for breakfast. Heading back to Dei Ey hike up the ridge through the community forest stopping now and again to study natural and human dramas in the university of the community forest. Departing for SenMonorom from the community lodge, say farewell to your hosts and to the Mondulkiri Protected Forest. 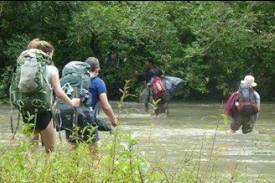 Three changes of clothes, long pants and shirt with sleeves during the trek, good hiking shoes, sunscreen, hat, mosquito repellent, flashlight, sandals for village, sarong for bathing (required for women), camera, toilet paper. 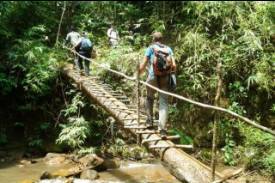 This 2 day trek through the Dei Ey Community Forest inside the Mondulkiri Protected Forest takes you into a mountainous forest camp and the world of the Phnong people where you will spend time learning about the lives and culture of these famous woodsmen. Learn about the birds, animals, plants and trees of the forest. Camp on the Chbar River on the boundary with the Phnom Prich Wildlife Sanctuary. 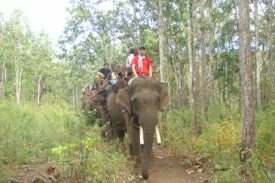 The two protected areas — Phnom Prich Wildlife Sanctuary and Mondulkiri Protected Forest — form one of the largest complexes of connected protected areas in Southeast Asia, covering more than one million hectares in a region referred to as the Eastern Plains. The area is considered one of the World’s Biodiversity Hot Spots. The trip departs from the WWF office in SenMonorom heading north into the Mondulkiri Protected Forest. Arriving at the Dei Ey Community Lodge meet your community hosts. 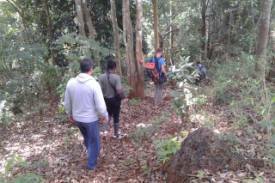 Starting in the Dei Ey Spirit Forest, hike through the village before entering the Community Forest. Along the way down to the Chbar Forest Camp learn about the life of the Phnong and their intimate relationship with their forest environs. Enjoy at picnic lunch under the forest canopy. Reaching the Chbar River, set up camp, enjoy a campfire dinner before retiring to the lull of the nocturnal symphony of the tropical forest. 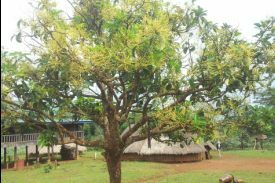 This 2 day excursion to the Dei Ey Community and their forest inside the Mondulkiri Protected Forest takes you into the forest home of the Phnong people where you will spend time learning about the lives and culture of these famous woodsmen. 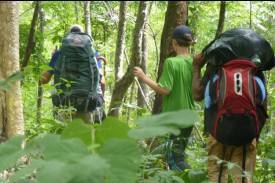 Spend 1 day in the community’s forest learning about the birds, animals, plants and trees. Then experience a day in the life of the village. On this tour you will learn about the special relationship the Phnong have with the forest and how they are trying to protect their traditional way of life along with their community forest. Early risers stalk forest birds and look for signs of wildlife before returning to the lodge for breakfast. Start the day’s excursion by learning about the beliefs and practices around the Spirit Forest. Pay your respects to the ancestors in the burial grounds and learn how the Phnong provide for their welfare in the afterlife. You will spend the rest of the day with your hosts in their village or fields learning about how they go about their daily tasks or working with them in the fields. This might include pounding and winnowing rice or harvesting peanuts. It depends on what the work of the season requires. Lunch will be hosted in a community member’s home. 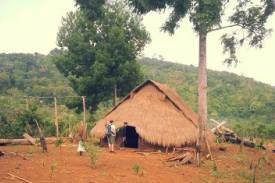 Departing for SenMonorom from the community lodge, say farewell to your hosts and to the Mondulkiri Protected Forest.